By 1914 the Indian Army had a long and well established fighting reputation and consisted of a formidable fighting force of infantry, cavalry, artillery, engineers and all the support troops necessary. Indian Divisions based on the military districts of India had been formed and as the war in France and Flanders increasingly looked likely to continue beyond 1914 the Indian Army was mobilised for service on the Western Front. Troops were despatched to the battlefield and others moved to Britain to establish bases to allow re-enforcements and training if the war continued. This image shows Indian troops settling into temporary quarters in the New Forest in the early Autumn of 1914. The arrival of these men caused quite a stir as it was the first time that large numbers of Indian troops had been present on British soil and images of them filled the popular press. At this stage, as the photo shows, the Indian troops slept in tents but they would remain in the New Forest well into 1916. Two Indian hospitals were established in the area and the tents later replaced by wooden huts. 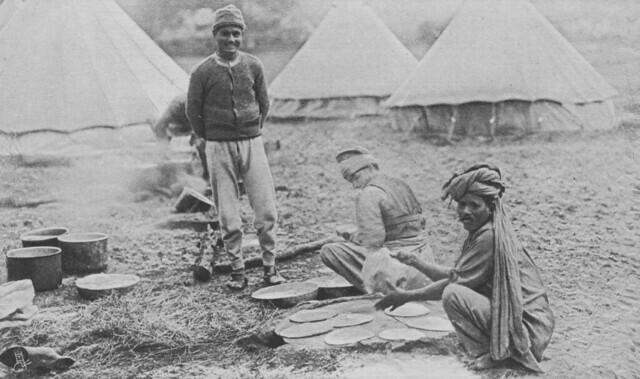 Many of the 1914 images show the Indian troops cooking – while Indian food today is very much a national dish it was largely alien to the generation of WW1, unless they had seen service in India themselves. This entry was posted on 10/09/2012 by sommecourt. It was filed under Home Front, Indian Army, Western Front, WW1 and was tagged with 1914, Indian Army, New Forest, WW1.